The threat of the Blue Ninja revs up a couple notches as Cobra goes from offensive to defensive upon learning startling new intelligence. Meanwhile, Storm Shadow and Snakes Eyes run into trouble following their own leads, and get timely help from a much-anticipated ally. 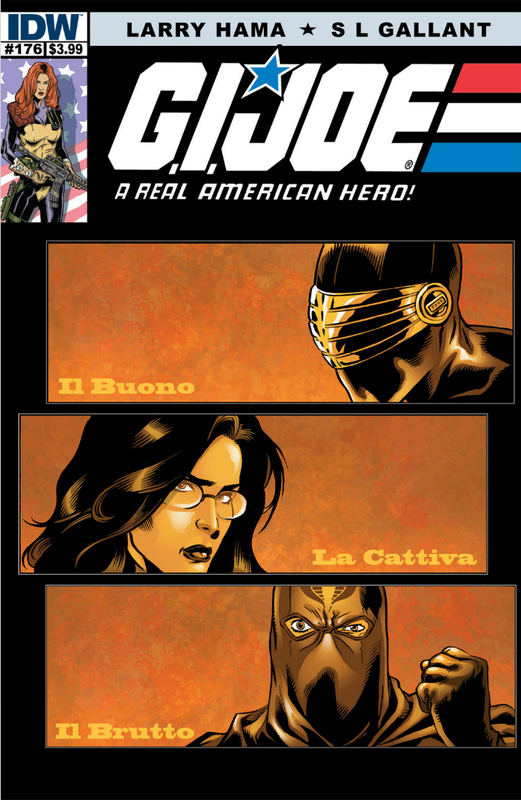 The Blue Ninja has been the central storyline of A Real American Hero for the last five issues. And Hama keeps on ramping up the intrigue. From the opening sequences of the Viper infiltration of a Maine facility to the much more subtle and successful infiltration of the Blue Ninja operatives into Broca Beach, Hama supplies more than a couple "Holy $%!&!" moments. The death count gets surprisingly high, and the many of the victims (women and children) lets us know that this is a threat like none the Joes have faced before. The overall story is moving quick and building tension, so it's difficult not to get engrossed in book. There are a couple plot holes that's developed over the past couple issues, including a huge coincidence in this one. A prisoner of the Joes mutters a single last name while under medication, which the Joes correctly indentify, and then correctly forward to Storm Shadow and Snake Eyes on their independent mission. I understand Hama's use of this coincidences to move the story forward, and in that respect, it's excusable, although admittedly it does detract for the overall quality of the storytelling for these deus ex machina to be popping up every issue or so. Hama continues to focus the entirety of these past several issues on this one story. Granted, he's been telling it from several different viewpoints. And it seems that Hama has so much story to tell he may not have room for his standard juggling of multiple plots. Still, only one Joe character, Snake Eyes, seems directly involved in this (at least until the end), so there are plenty of other characters and situations that could be explored. Hama does tease a little about an upcoming secret Cobra plot "you-know-where," and three new Joes are now joining in the hunt for the Blue Ninjas, so fresh stories should be coming soon. Through covers and a few throw-away panels from the last several issues, we knew that the Baroness was making a significant appearance soon, and she finally does in this issue. And quite an entrance it was, too. Since the relaunch of this series, Hama's use of Baroness hasn't been that strong. She had been brainwashed, had been in an odd relationship with Billy, and had to be rescued by Destro. The interpretations of Baroness in the main IDW series as well as the Renegades cartoon has whet my appetite for a strong, independent, and deadly woman. Hama created such a character in G.I. Joe #1, so it's especially sad we haven't seen that same strong character in his writing since the relaunch. Her appearances in the last several issues, brief as they were, seem to be a step in the right direction. Fingers are crossed. S.L. Gallant continues to produce great art with a classic style that perfectly complements Hama's storytelling. Although I may occasionally give him a hard time for paying too much homage to the classic looks of various characters without updating them to a more realistic, modern style, it's much to his credit and skill that he can depict these characters in their vintage costumes without making it look dated. Vipers and Tele-Vipers are over a quarter-century old, but their storming the Maine facility looked perfectly contemporary, not to mention awesome. While I was growing up and reading Hama's original Marvel run monthly, I remember having to have a dictionary at my side for when Cobra Commander spoke. I can probably thank Hama for boosting my SAT scores. This month, our "Word of the Day" is "aasvogel." I had predicted that I would tire of the Blue Ninja storyline by now, but I'm glad I'm wrong. Tension is building up, and now that the Blue Ninja has Cobra centered in their sights, I cannot wait until the next issue. Action packed and fast-moving, and the last few pages seem to promise the ride is only going to get wilder. Highly recommended.